After years of unsuccessful attempts at conceiving a child, Ana and James become parents overnight, when a terrible accident makes them guardians to 2-year-old Finn. Suddenly, two people who were struggling to come to terms with childlessness are thrust into the opposite situation-responsible for a small toddler whose mother's survival is in question. Ana and James have been married for a number of years and trying to become parents for most of those years. The last pregnancy ended with a miscarriage. Just when it seemed they were becoming used to the idea of never becoming parents, their lives take a dramatic turn. They become foster-parents to the two-year-old child of their dear friends, Marcus and Sarah's son, Finn when a tragic accident results in the death of Marcus and nearly-fatal injuries to Sarah. It appears that Ana had become not only at peace with the notion of never becoming a parent, but almost happy that she would never have to disrupt her life and career with motherhood. Ana isn't overly maternal but she does seem to border on being obsessive-compulsive about her habits and lifestyle. She appreciates having a home that isn't exactly child-friendly. She actually enjoys the regimentation of being a research lawyer. Now that she is faced with being a surrogate mother to a two-year-old, she isn't quite sure why she ever considered being a mother in the first place. Is it possible the maternal instinct will eventually kick in? Will she ever be completely comfortable around Finn? While Ana is dealing with the inner turmoil of not being maternal, James is quite happy in his role as surrogate father to Finn. Unbeknownst to Ana, James has already established a relationship with Finn and often took him on outings to give his mother a much-needed break. Now that James is unemployed from his career in television, he is able to commit most of his time to Finn and seeing to his needs. Everybody has Everything seems to be about just the opposite, not being able to have everything. In Ana's mind having everything seems to mean having a marriage, career and family. If she doesn't have all of these components in her life then she is somehow deficient in the eyes of society. She is very happy with her career and relatively satisfied with her marriage, but should she want more? James is dissatisfied with his lack of a career and is searching for something to redefine himself. His relationship with Ana isn't as strong as it once was and he also seems to be struggling for a balance there as much as with his career options. I found Everybody Has Everything to be a relatively quick read, but I couldn't really connect with the characters. It didn't make sense to me that if Ana wasn't really ready for motherhood, she'd spend so much time, money and effort on getting pregnant in the first place. James came across as mature in some instances and in others he reminded me more of an immature young man than someone approaching his early forties. He was a good father figure to Finn and seemed to relish the time spent with him. He was also a good friend to both Marcus and Sarah. 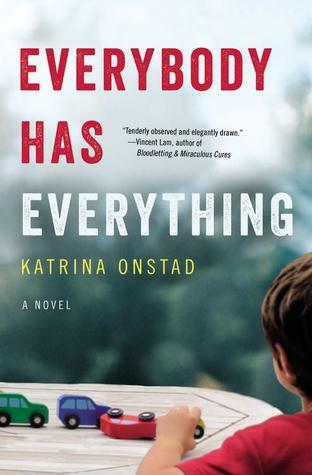 I liked the premise of Everybody Has Everything, I just think it got a little lost along the way . . . or at least it seemed to for me.